#1 Sports Game on smartphone in the US and 70 other countries. Over 2 million players! This is arcade air hockey NHL and CHL game with leagues and multiplayer. Players face off across a ice rink, in a hockey duel – one player and one keeper one each side. Play is rapid and rough, with players spending as much time eating the ice as on their feet. There are three different single player modes (Tournament, Quick Match and Deathmatch) and a single-device multiplayer. There are also tons of unique characters to choose from such as lightning fast Antero or heavy-hitting Enviro-Bear. Team them up with crazy goalies like Santa and you’re sure to get the upper hand. Superb animation and charismatic characters make this a game you won’t forget in a hurry. We dare you to take on the championship or challenge your friend in the most intense single-device multiplayer you've ever experienced. • Tournament mode: Can you defeat the legendary Skar? • Over 2 million players can’t be wrong! • The best single-player Hockey game around. © Original developer Mountain Sheep, porting and publishing Herocraft, 2015-2018. 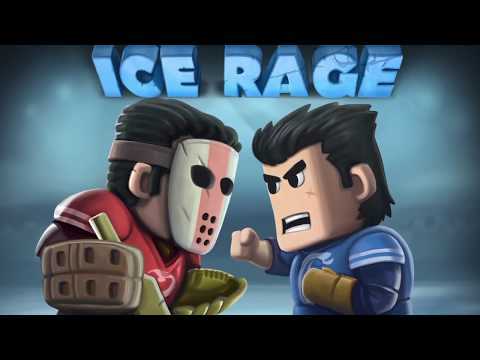 Ice Rage brings ice hockey into the 21st century, whilst paying tribute to 1984's Hat Trick. Players face off across a ice rink, in a hockey duel -- one player and one keeper one each side. Play is rapid and rough, with players spending as much time eating the ice as on their feet. There are also tons of unique characters to choose from such as lightning fast Antero or heavy-hitting Enviro-Bear. Team them up with crazy goalies like Santa and you're sure to get the upper hand. Superb animation and charismatic characters make this a game you won't forget in a hurry.